One we go to a couple times a year for entertainment, the other at least weekly out of necessity. 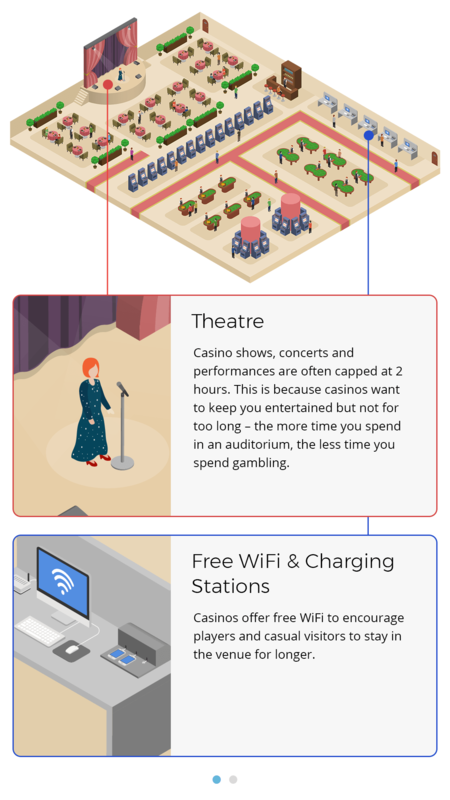 Although the reasons we go to them couldn’t be more different, casinos and supermarkets are extremely similar in design. 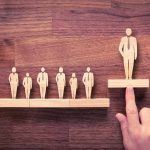 Thanks to an increased understanding in consumer psychology, both use principles gleaned from the latest research to keep us playing, shopping, and feeling good for longer. 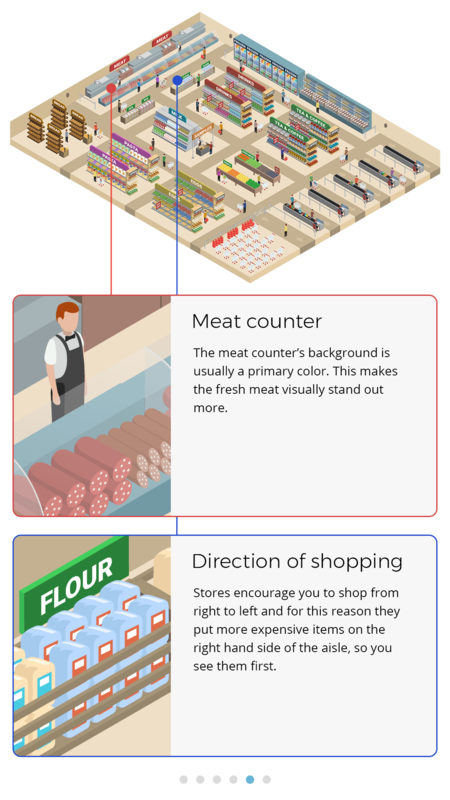 Thanks to research showing that objects to our left catch our attention more than those to our right, grocery stores are encouraged to steer customers in a counterclockwise direction. To pull shoppers in this direction and ensure they keep looking left to the interior of the store, planners put visually catching items (like the floral department or an eye-catching seasonal display) to the right of the entrance. 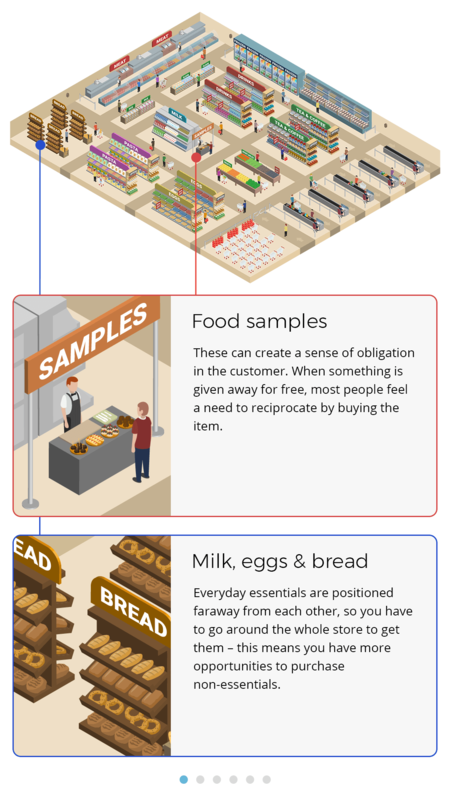 Staples like bread, milk, eggs, and even the bathrooms are all positioned away from each other and at the store’s furthest reaches, making sure shoppers pass more potential purchases along the way. In modern casinos, this segmented approach is further exaggerated. High-rollers are generally corralled into one area featuring the higher-limit games while more casual players and hotel guests are diverted through the slots and cheaper table games on their way to and from the elevator, bathroom, and lobby. 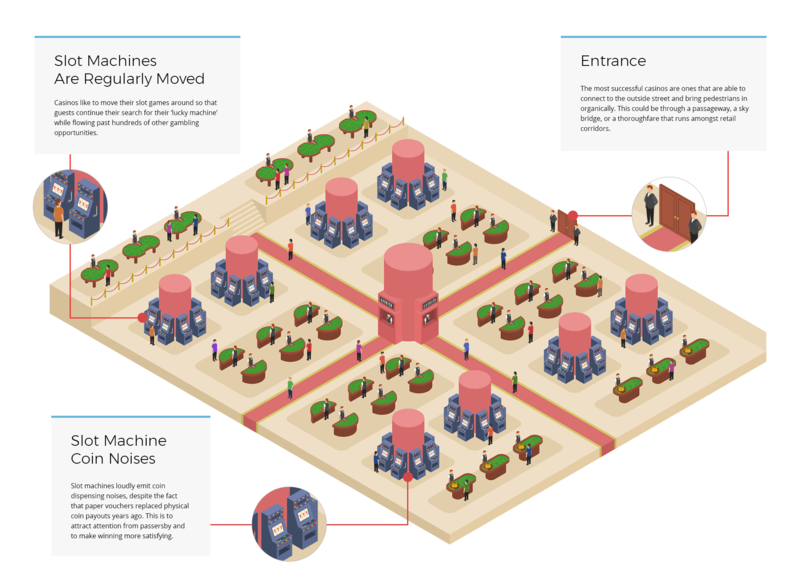 Casino layouts also take into account the preferences of different demographics. Slots are the favorite game for a majority of female gamblers, who tend to enjoy playing among tamer crowds. To accommodate this, casinos make sure there are many slots away from heavy foot traffic. 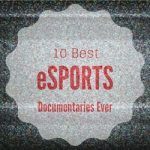 And since having a social experience while playing is important to younger players, many machine-based games are clustered together instead of in long rows to encourage a more social environment. 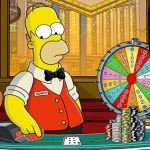 The demographic of the casino’s visitors also influences what games are available and even the lighting of the space. Be it in a supermarket or a casino, none of the six senses have gone ignored by designers. Grocery stores today actually share many of the principles casinos once held as gospel: limited natural light, limited windows, and few (if any) clocks. Instead of the time or sunlight, at the front of most grocery stores the senses are bombarded with the sights, smells, and sounds of the three most stimulating departments: floral, produce, and the bakery. 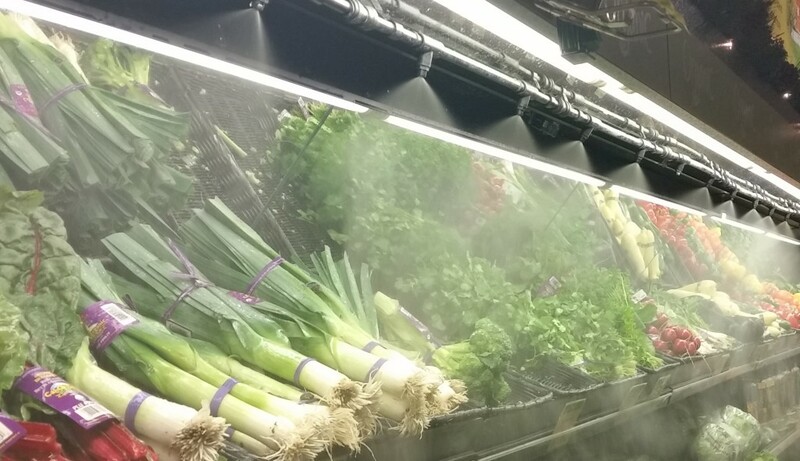 Produce’s bold colors are enhanced by special lighting and sprays of mist (which actually make it spoil faster in lieu of making it appear fresher). This produce first has to pass high standards of appearance to even make it to the shelf. For instance, bananas generally have a yellow closer to Pantone 12-0752 after research showed that customers were more attracted to a ‘buttercup’ color than the slightly more vibrant yellow of Pantone 13-0858. Even the music played at the grocer isn’t by accident. 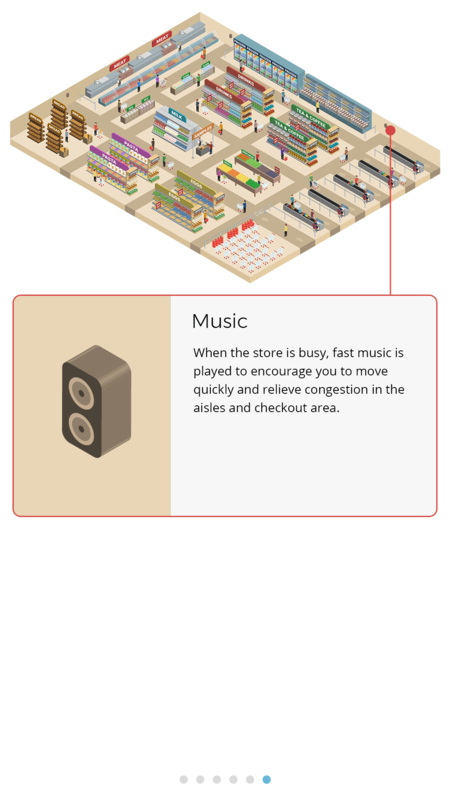 One landmark study showed a 38% increase in sales for grocery stores that played music compared to those that didn’t. All these positive sensations work together to put shoppers in a positive, healthy-feeling mood that whets the appetite. 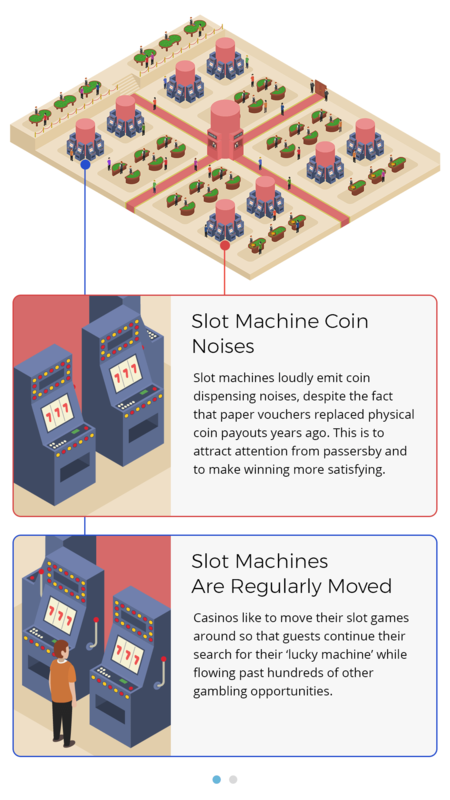 One study looked at the impact of releasing a scent deemed ‘pleasant’ in different slot machine areas. 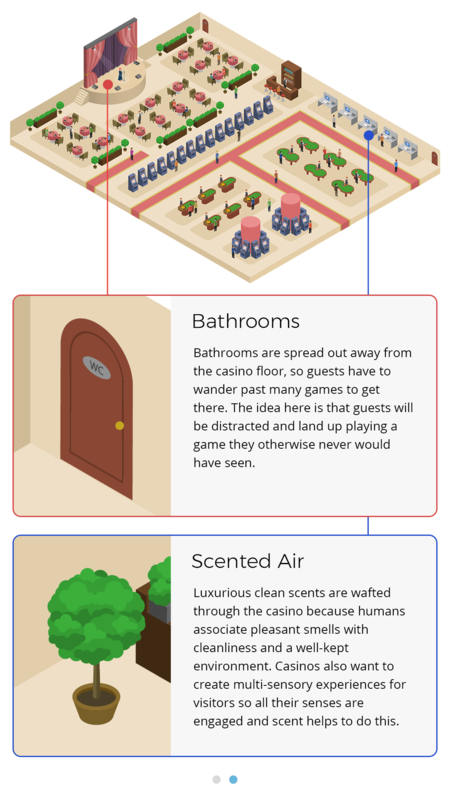 Compared to control periods where no odor was released, the scented area turned 45% more profit, suggesting that people are more likely to hang around and gamble in an area that is olfactory-pleasant. Thomas and other modern casino designers create this opulent environment by breaking many of casino design’s old rules by featuring high ceilings, natural sunlight, elaborate artwork, and even ornate decorative clocks, all which aim to leave gamblers feeling fresh and in a mood to stay and play longer. The best planners know that first impressions last and put a focus on what guests see when they enter. 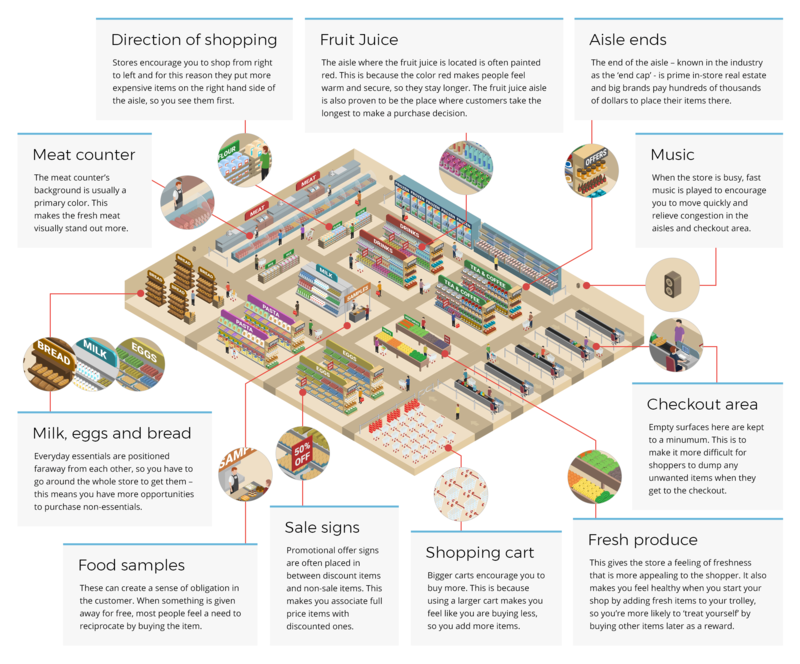 In an attempt to slow them down to look at more potential purchases, grocers place fresh samples and out-of-the-box products shoppers can play with right upfront. One-way entrances and exits (with the checkout aisles in between) make it difficult to quickly enter and leave as well. 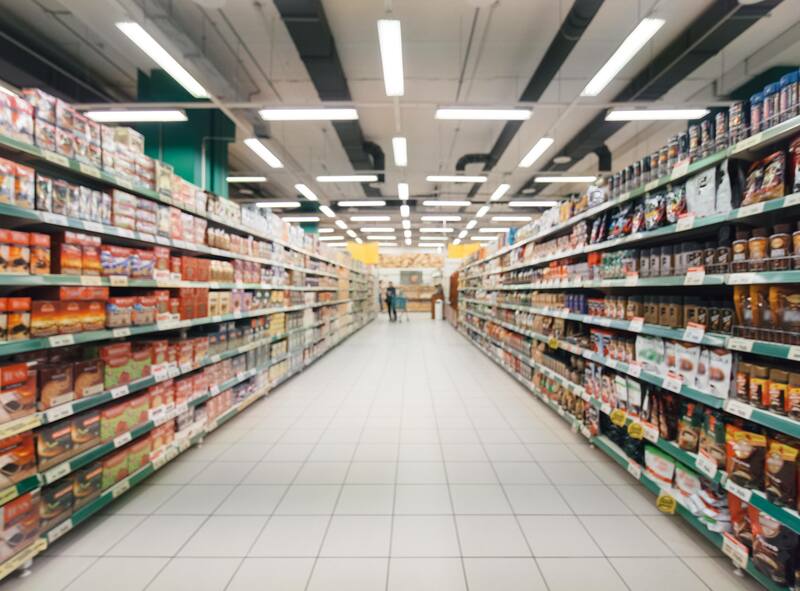 Even without venturing down any aisles on their way to the exit, shoppers are likely to see many endcap shelves, where products sell eight times as fast. Old-school casino philosophy dictated bombarding patrons with gambling the second they entered, accomplished by placing machines immediately inside the front entrance. Today’s casino entrances are more reminiscent of grand hotel lobbies with their ornate artwork and open layouts. In a recent redesign of Vegas’ Bellagio, a massive Dale Chihuly-designed sculpture hung from the ceiling, making gamblers feel welcome and invited to stay and play in a relaxed space. 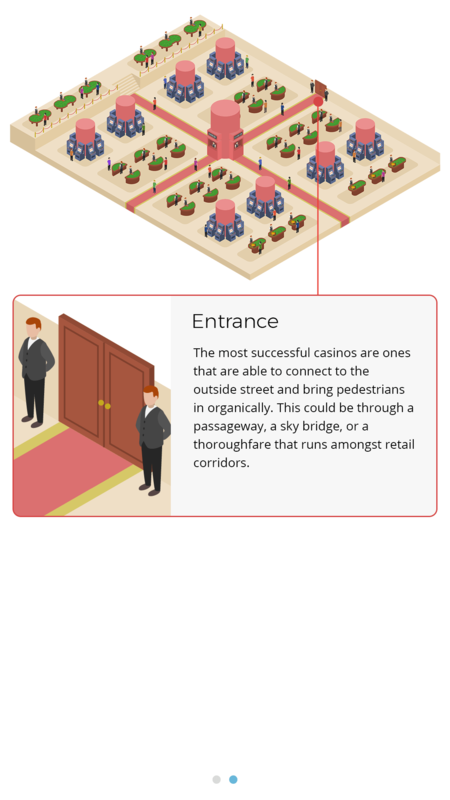 The position of casino entrances are also designed to ‘catch’ outside passersby from the street or other pedestrian walkways like skywalks. A challenge both casinos and grocery stores have is to try and appeal to wide varieties of budgets and demographics. 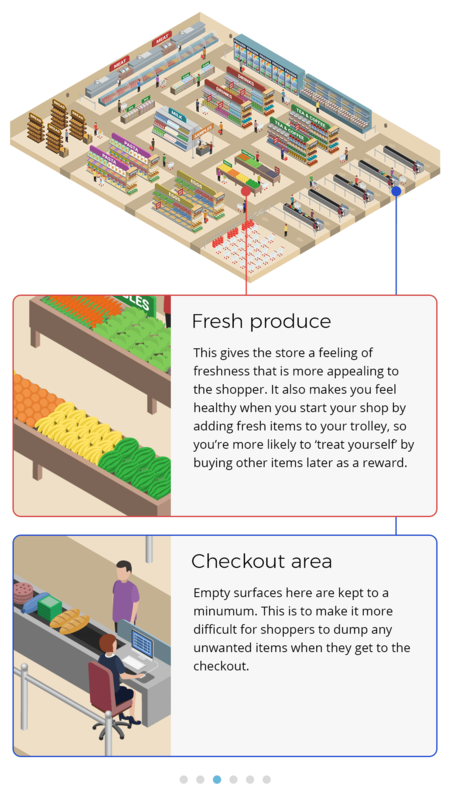 At groceries, aisles that are 6+ shelves high allow plenty of room for a range of differently-priced products. 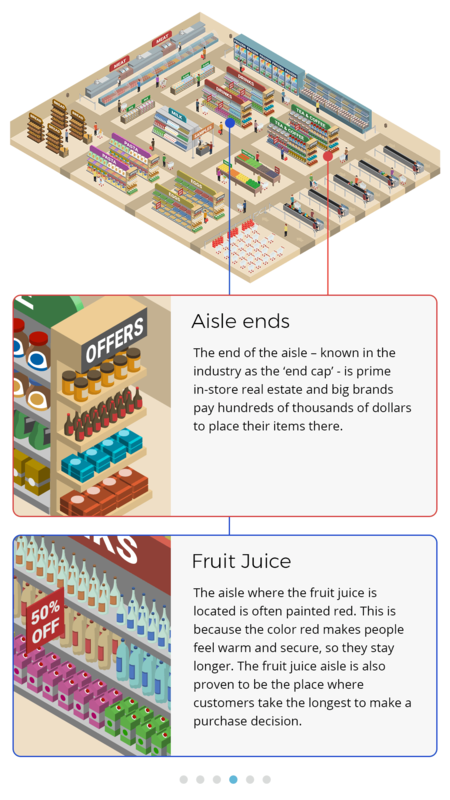 Where items end up is no accident, with the higher-priced brand names situated just at eye-level and cheaper off-brands down low where they are harder to see. 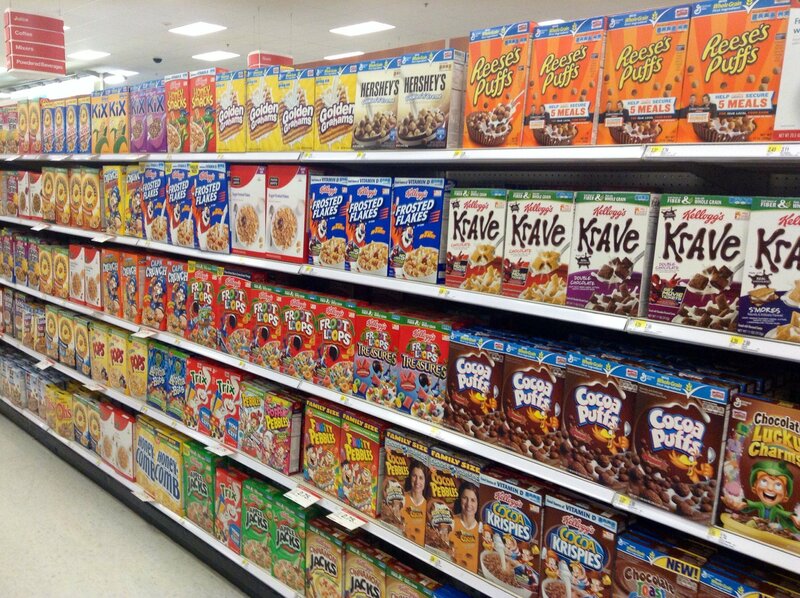 One exception is with children’s cereals, which live right at eye-level where hungry and persuasive kids see them best. Casinos are facing a massive shift in clientele as their biggest money-making demographics, such as female slot players aged 55-60, are getting older. This has led to a new focus on millennials, 39% of which (in America) already visit casinos on a regular basis. 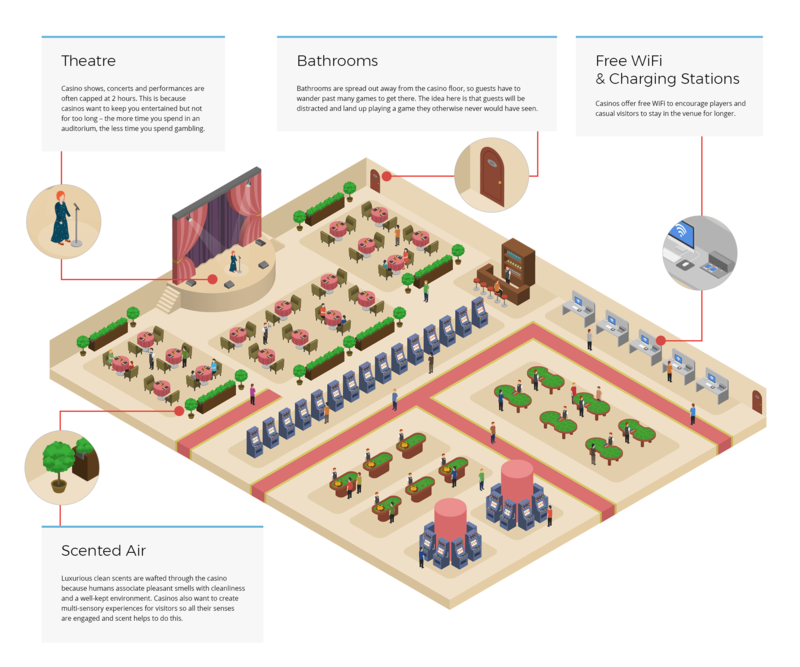 To appeal to their preferences, designers are incorporating more tech-friendly elements like Wi-Fi and charging stations, re-positioning layouts to be more social-friendly, and offering entertainment options like shows and lounges integrated into the casino floor. 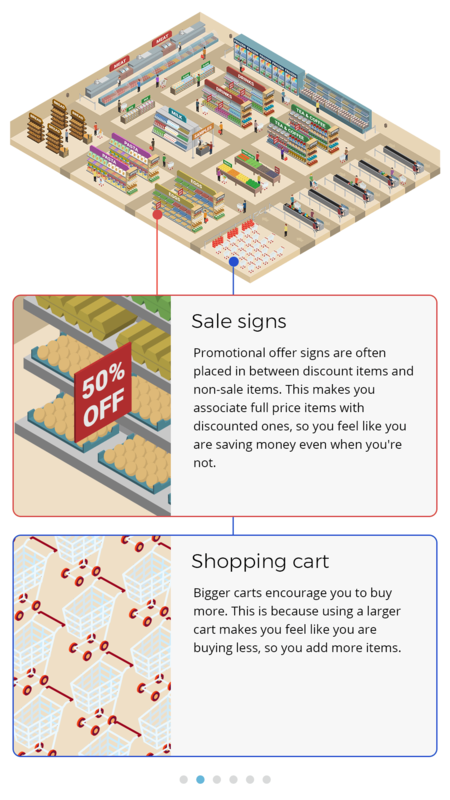 People and their tastes will always evolve, making the creation of the perfect store or casino layout an ever-moving target. These changes of course will always aim to do one thing: make us spend more money (although there are ways we can get around this and save money on our grocery bills). 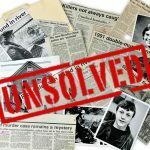 This is why it’s important for us all to be aware that whether we are looking for jalapenos or for jackpots, we are less in control of our purchasing decisions than we think. Hirsch, A 1995 Effects of Ambient Odors on Slot-Machine Usage in a Las Vegas Casino, Psychol. Mark., 12: 585–594.